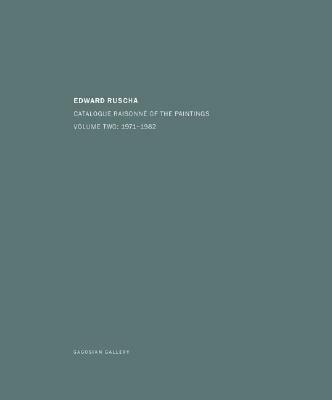 The Catalogue Raisonn of the Paintings of Ed Ruscha is a six-volume series of books co-published by Steidl and Gagosian Gallery. This is the second volume, which contains entries on 178 paintings completed between 1971 and 1982--from the artist's crisis at the onset of the 70s, when he "quits painting pictures," to his first major museum retrospective, which opened in March 1982 at the San Francisco Museum of Modern Art. The catalogue includes a comprehensive exhibition history, bibliography and biographical chronology, as well as a preface by the editor Robert Dean, an essay by UCLA film historian Peter Wollen examining Ruscha's use of color as it relates to his use of language, and an essay by the late Reyner Banham. Each volume of the catalogue, designed by Bruce Mau, has a stitched binding and a cloth cover with silver-colored embossing protected by an embossed slipcase. Specifications for subsequent volumes are the same.